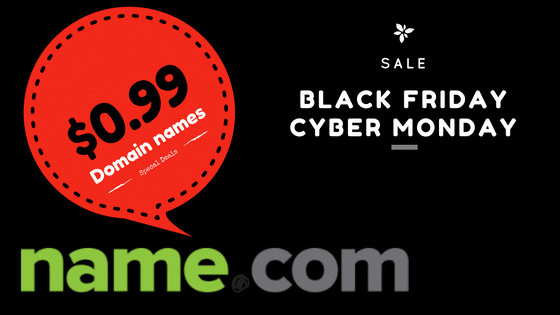 Name.com this morning launched a promotion on Black Friday & Cyber Monday 2017, discounting a range of domain names, only from $ 0.99 / year, including .COM domain name. Similar to last year, this Friday Name.com will not run Happy Hour program but rather a series of days preferential for a variety of domain names such as: .BIZ , .PRO , .SHOP , .CLUB , .ORG … and .COM . The program will start around 2pm on November 24, 1977 in Vietnam time. When registering, you only need to use the coupon code below, register up to 10 domain / account . *** The offer only applies to new registrations. Payment is made by both PayPal and Visa / Master card. These are almost the cheapest rates in the world, so you have to enlist some .COM children and some .CLUB, .PRO or .SHOP to make satellite site offline. Black Friday deals are gradually being launched by the vendors, remember to regularly follow the aggregation of HOT Black Friday 2017 promotions to keep up to date information.